Canyoning is by far one of the most rapidly increasing adventure activities in the Blue Mountains. There are many commercial groups which provide canyon tours in the Blue Mountains. Canyons have been around for millions of years, with the adventure sport of canyoning starting around the 1940's. Many canyons have been discovered since then, with more still being found today. There are currently over 300 accessible canyons today in Australia. Canyoning is a combination of; abseiling, swimming, rock climbing, li-loing, navigation and bushwalking and more recently mountain biking. 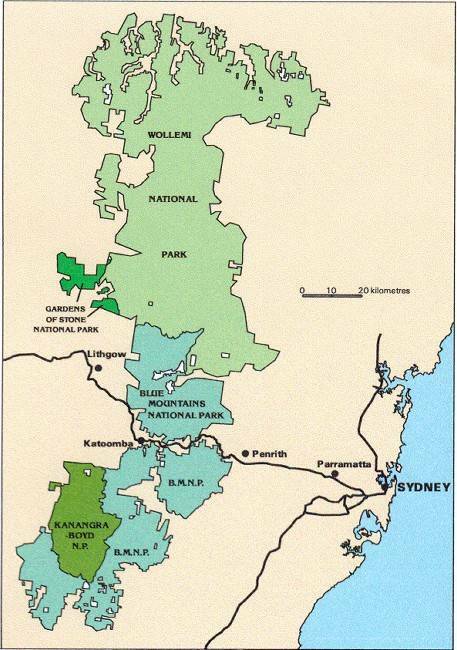 Canyons can be found in the Wollemi, Kanangra Boyd, Blue Mountains National Parks, and the Newnes State Forest. These parks are illistrated on the map. There are two different types of canyons, open and slot canyons. Open Canyons - these type of canyons are an open creek with abseils, climb downs and water jumps. Abseils in these canyons can range up to 60 metres. Kanangra Boyde National Park is renowned for these type of canyons. Slot Canyons - comprise of deep narrow, wet, dark sections. Canyon sections can be as narrow as several feet. Tunnel swims, water jumps, tricky climb downs, climb around, abseils down waterfalls into dark caverns all add to the excitement of slot canyons. Abseils within these canyons vary between 0 - 30 metres. The most common being under 20 metres. Some canyons require rock climbing skills for the exit.